1925/26 saw a lot of changes to the Millfield ground. A new main stand was built, Which still stands to this present day at a cost of £1,300 and waste from the coal mines was deposited around all sides of the ground to form grassed banks for better spectator viewing. 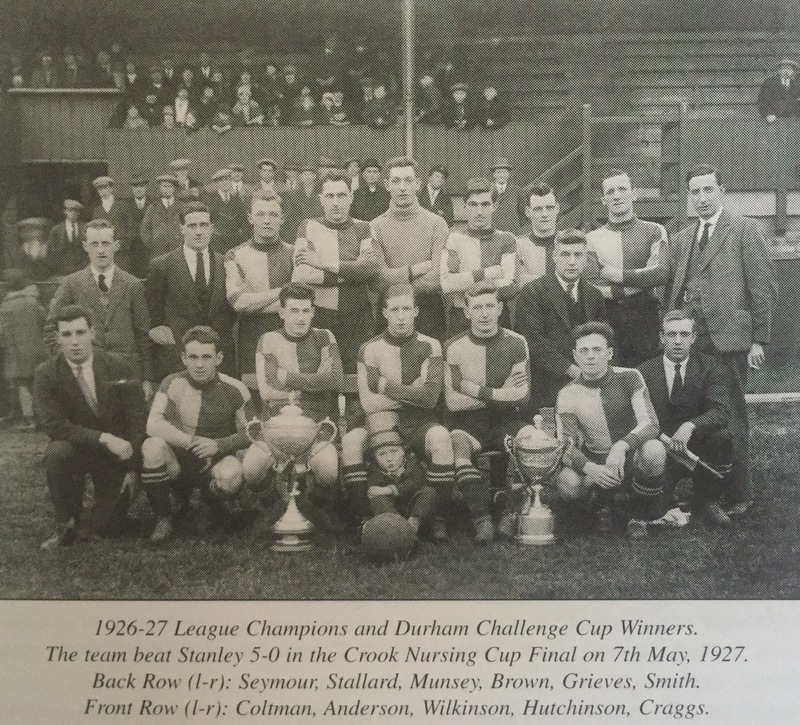 That season was a bit of a mixed bag for Crook who won the Durham Benelovent Bowl with a 3-1 win over Shildon at Kingsway but lost the League cup final 2-0 to Willington at the same venue in front of a crowd of 4,323. The 1926/27 season proved even more successful and in an attempt to attract better quality players the club decided to give a pair of silk stockings and a handbag to the wife or girlfriend of every player that signed for the club. This seemed to do the trick as on the 30th April 1927 the club clinched the league title with a 4-0 home win over Loftus Albion in front of a crowd of 10,000 some of which will have been very smartly dressed with their silk stockings and new handbags. The club also reached the 2nd round proper of the FA Cup after beating Workington 2-1 away in the 1st round. They were drawn to play Southport away in the 2nd round who were then a Football League club but could not continue the heroics of the Workington game losing out 2-0 to the professional side. However they did gain some consolation when they won the Durham Challenge Cup for the first time beating West Stanley 4-2 in a replay after drawing 2-2 in the first game. They also reached the FA Amateur Cup quarter final and won the Crook Nursing Cup to make it a 3 trophy haul to conclude an excellent season but little did anyone know what was waiting around the corner! 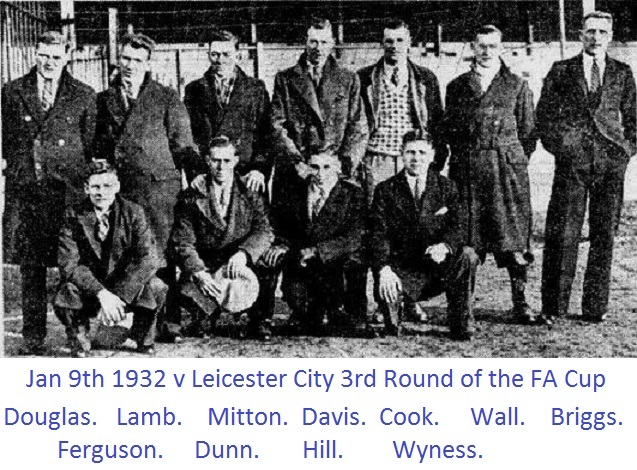 The 1927/28 season saw the club start where it left off the previous season by again reaching the 1st round proper of the FA Cup. 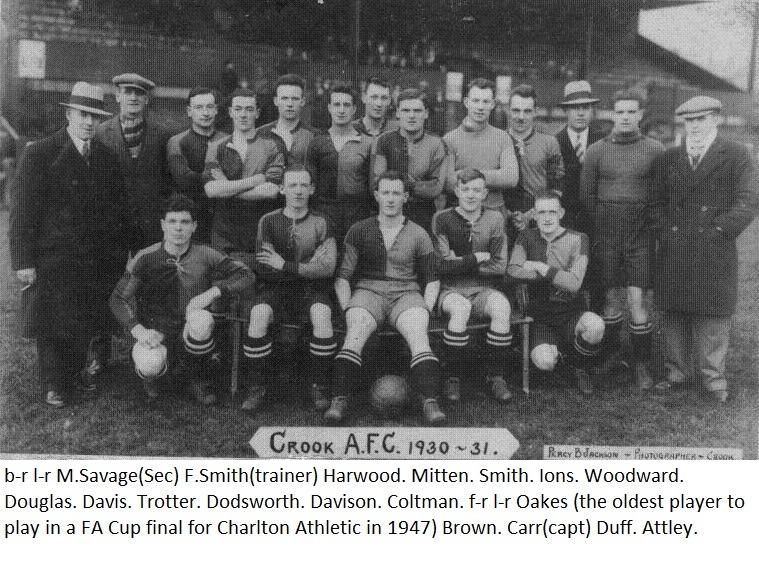 They were drawn away to Football League side Rochdale but the full timers proved to be too strong for Crook running out comfortable 8-2 winners in front of a crowd of 3,719.
on the 12th of January 1928 the club was thrown in to turmoil with the “Crook Town Affair”. It was alleged that local rivals Bishop Auckland had reported Crook Town to Durham FA foe illegal payments to players. This led to all the players and members of the committee being suspended while a full investigation was carried out by Durham FA who demanded that Crook surrendered their “books” for immediate scrutinisation. When Crook found out who had allegedly informed Durham FA regarding these payments they then countered by providing evidence that a number of clubs in the Northern League were in fact making the same kind of payments that Crook were. This led to 341 suspensions to players and committee members at numerous clubs and brought the Northern League to a standstill for a number of weeks. 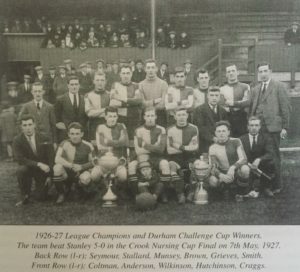 After Spennymoor United won the Durham Challenge Cup That season Current holders Crook Town refused to return the trophy until Durham FA returned their “Books”. The trophy was not returned for quite a length of time. Due to the fact that the majority of Crooks officials were all suspended it was decide that the only option that the club had was to re form without the suspended officials. 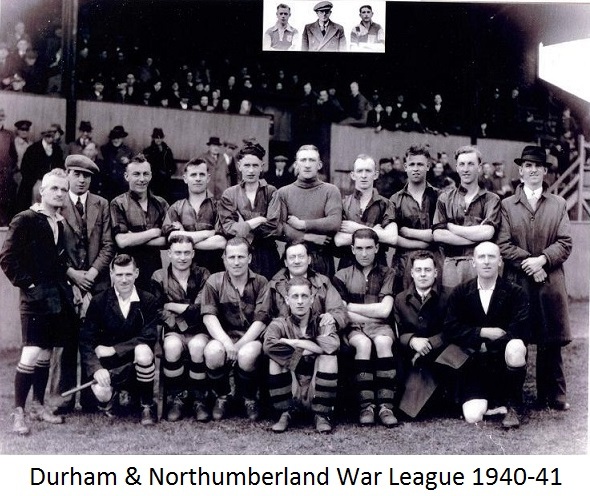 However, the Northern League got wind of their plot and refused the reformed club entry to the league so the 1928/29 season saw the club competing in the Durham Central League finishing the season in runners up spot. the following season saw the club accepted back into the Northern League. In the 1930/31 season the club took the decision to turn professional and join the North Eastern League. The club were now regularly playing in front of gates of 5,000 plus and it was felt that the club were financially stable enough to make the leap. That same season the club again reached the 1st round proper of the FA Cup. They were drawn at home to Stockport County from the football League and ran out 3-1 winners gaining their first ever victory against a Football League side. The 2nd round saw them drawn away to Aldershot gaining a creditable draw but better was yet to come when they won the replay 1-0 in front of a crowd of 6,879 at Millfield. The 3rd round saw them pitted against 1st Division Leicester City. Excitement around the town reached fever pitch as the chances to see a 1st division side in the flesh were limited due to the travelling costs to get to Sunderland or Newcastle at the time. However, the Crook committee misguidedly decided to switch the tie to Filbert street for financial reasons which caused a near riot in the town.The ladies branch of the supporters club who raised a lot of finance disbanded over the affair and a number of supporters vowed never to watch Crook again. 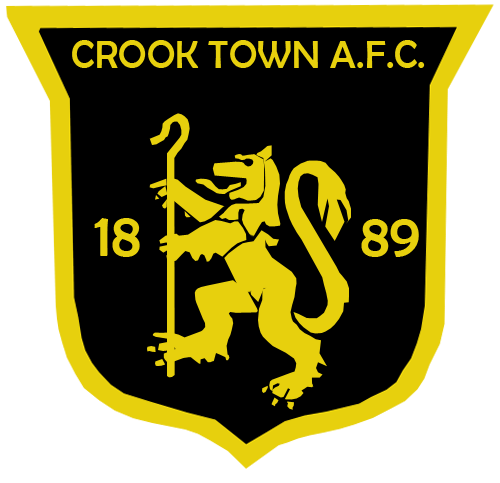 The game ended in a bit of a disaster for Crook losing 7-0 in front of 21,500 but it was mission accomplished as far as the financial side was concerned as Crook collected half of the gate receipts. Crook rounded off the season by winning the Durham Challenge Cup beating Spennymoor 2-1 at Kingsway. 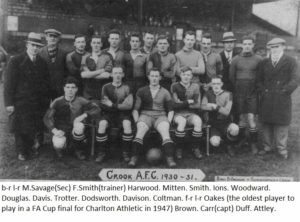 In the 1932/33 season Crook again reached the 1st round proper of the FA Cup being drawn away to Crewe Alexander but losing 4-0 in front of a crowd of 7,000. Over the next couple of seasons the club struggled financially. 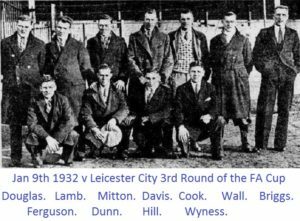 The money gained from the Leicester City game had all but ran out and falling gates due to the Leicester decision saw the club fielding mostly amateur players from the local area. Indeed the club were not expected to start the 1936/37 season at all due to their financial plight but a decision was made to revert back to “Amateur” status and re join the Northern League. They enjoyed some success in that season by beating Bishop Auckland 2-1 in a replayed Durham Challenge Cup Final. 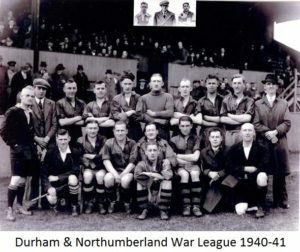 During the 1939/40 season many clubs disbanded due to the onset of War and indeed on the 29th June 1940 the Northern League suspended all playing activities until the end of the war. Some sporadic football was played during wartime and two local clubs Hole in the Wall Colliery and Peases West Welfare amalgamated to form Crook Colliery Welfare.